High Moon produced a great video on Scrum. Check it out! High Moon Studios, part of Vivendi Games, is a game developer currently working on titles for next-generation consoles. The company is founded by game veterans who are passionate about creating compelling, original entertainment experiences. High Moon is best known for Darkwatch (www.darkwatch.com), the hit console game based on original I.P. created by company founders. High Moon employs more than 100 people at a state-of-the-art game development facility based in San Diego County, California. For its next-gen game titles, the company's development teams are utilizing a product methodology known as Scrum, a process derived from Agile Methodology. 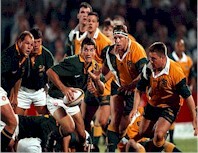 Scrum is named after the tight line of scrimmage formation in rugby where players huddle to move the ball up the field. In product development, the formation is applied in spirit. Scrum promotes small non-hierarchal, interdisciplinary teams who complete vertical slices of a project in brief work cycles called sprints. At High Moon, artists, designers and engineers work side by side and focus on demonstrable iterations meant to 'find the fun' in their projects early in the development cycle. The incremental and iterative approach allows for consistent evaluation of product features and quality. High Moon's innovative development methods and employee programs have been recognized by the San Diego Society for Human Resource Management with a "2005 Workplace Excellence Award" and IT Week Magazine as one of "2005 Top 50 Technology Innovators."